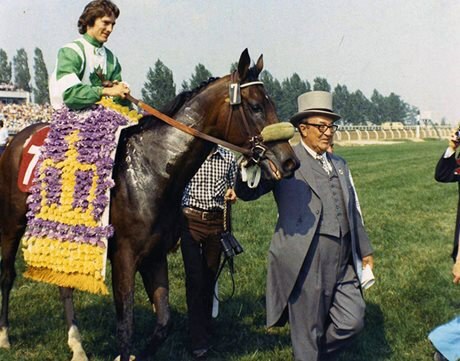 Sandy Hawley had a significant impact on thoroughbred horse racing and is considered Canada’s greatest and most accomplished jockey. Hawley began his racing career at the age of 17, walking horses at a Toronto racetrack. He won his first race in October 1968 at Woodbine Racetrack. In 1969, Hawley’s 230 wins made him North America’s top apprentice jockey. The following year, he became North America’s leading jockey with an impressive 452 wins, including his first of four prestigious Queen’s Plates. Hawley won numerous races in the United States, including Arlington, Belmont and Santa Anita Park. Twice named Canadian athlete of the year, Hawley retired in 1998 after a 31-year horse racing career and a total of 6,449 wins to his credit. The Sandy Hawley Award is presented annually by the Ontario Sports Hall of Fame to individuals who best exemplify dedication to the community. Learn more about Sandy Hawley on his website. See photographs and artifacts related to Sandy Hawley on The Lou Marsh Legacy website. Watch Historica Canada’s Heritage Minutes video on Hawley.